On June 6, 2009 I noticed in my calendar of Saints and Feast Days published by St. Herman Monastery that we celebrate the memory of a crippled woman who lived in extreme suffering yet endured her suffering with great patience and humility, and in return bore great spiritual powers in our days - Blessed Schemanun Macaria of Russia (+1993). 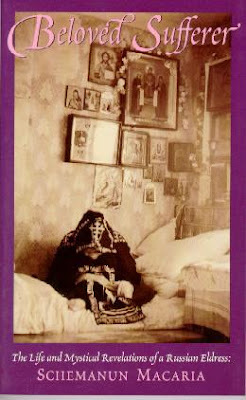 I first came across her life story through the book published by St. Xenia Skete titled Beloved Sufferer - The Life and Mystical Revelations of a Russian Eldress: Schemanun Macaria. This biography was first written in Russian by one of her spiritual children, Gennady Durasov. Soon after her death in 1993, in the Christmas issue of the Russian magazine Russky Palomnik (Russian Pilgrim), her story was first made public to the world. It was this original manuscript that was sent to Saint Herman Brotherhood in California and distributed by them in Russian until an expanded copy was sent by Durasov to be translated into English. It is this expanded copy that was published by St. Xenia Skete which is affiliated with Saint Herman Monastery. In the vicinity of Novodevichy Monastery, while in Moscow this early spring, literally on the threshold of the bookstore 'Radonezh', I happened to meet the author of these notes - Gennady Durasov. Almost the first words of his were about Eldress Macaria whom he highly revered. At that time she was alive and he had already completed her biography, her Life. Hearing this, I hesitated for a minute; but, being convinced of the sincerity of this good man, I began to implore the Lord to grant me the possibility of getting acquainted with the life of this living saint. Soon after Pentecost she died, and he at once sent me this Life, wonderful in its content, which we here are offering to our good reader. So far, from what we read in the introductory notes of Beloved Sufferer, we find a few disturbing things. First, we read that two manuscripts are given to Saint Herman Monastery for publishing - a short version for a Russian magazine and a longer version for an English book. Second, we read in the Russian edition that the author of these notes, Gennady Durasov, had already written the life of this holy woman while she was alive yet only passed it on for publication after the death of Mother Macaria. Essentially there is nothing wrong with this, but it plays a significant role as to why this book is no longer distributed. I first acquired this book in 1995, being struck with great curiosity over the shocking cover photo of the book and the intriguing title. I didn't read it at this time. I acquired a second copy of this book in 1998 from my wife who had received this book as a gift a few years earlier from her godmother upon her conversion to Orthodoxy from Catholicism. It would be ten years later however, in 2008, that I would finally pick up this book to read it. I found it to be an amazing and emotional read filled with wonderful spiritual instruction. Upon completing the book I searched the internet for any further information on Mother Macaria, but it was in vain. In fact, I was surprised that there was absolutely no further information on her life, at least in English. What further surprised me was that St. Xenia Skete no longer distributed this book and it was completely off the catalogue of Saint Herman's Bookstore. Because the book was no longer being sold, it suddenly became a rare item to own and booksellers on the internet were selling it as high as nearly $200 a copy and as low as $65 on Amazon.com for a used copy. This disturbed me because such an inspiring tale was almost impossible to be acquired for less than a hefty price, so I figured since I possessed two copies I would offer to copy one of my books for anyone that was interested. It was while I made this offer over the internet that someone contacted me to tell me that the book Beloved Sufferer was no longer distributed by the fathers of Saint Herman's because it was discovered that Schemanun Macaria had fallen into prelest (Russian for "spiritual deception"). This news blew me away and I could hardly believe that such an inspiring tale of a suffering bed-ridden woman who displayed such amazing spiritual gifts could be the victim of demonic forces. I was so disturbed that I sent an email to the fathers at St. Herman Monastery asking if this accusation is true and if this was the reason why the book was no longer distributed. To answer your question, no, she did not fall into prelest. What happened was this. When the text was first submitted to us, it was fairly short. Fr. Herman asked the author if he could find more about her. He later sent what we published as the book. We later learned that he made up a lot of what he sent the second time, just to make us happy. We can no longer separate fact from fiction. In one sense, I was relieved to find out that Schemanun Macaria had not become a victim of prelest. At the same time, I was extremely saddened over the fact that sections of this book I had read and been inspired by were fiction. I'm not a big fan of Oprah, but I honestly kind of felt like she did when she discovered James Frey's memoir was fiction. I requested further details of the kind father who responded to me, but I received no reply. Therefore, it is hard to confirm how true this information I received is. I can only take them at their word. All this does not take away the fact that Schemanun Macaria was a grace-filled woman of our times. What it does take away however is an accurate account of her life. Therefore I appeal to my Russian brethren to separate fact from fiction regarding the life of Mother Macaria and make this available to the English speaking world. Let us pray that the Most Holy Theotokos reveal the truth about this saintly woman who was so dearly beloved by her.